It’s amazing how “hero” still attaches to Jessica Lynch, the blonde, waiflike Army private from West Virginia who, through no exceptional effort of her own, became the best-known American military figure of the early days of the Iraq War. Lynch was in Florida the other day, promoting I Am a Soldier, Too, a book about her that was written by Rick Bragg and published in November 2003 to decidedly mixed reviews. In a report online, a Florida television station gave 267 words to Lynch’s visit; in that report, “hero” was invoked twice. It’s amazing, too, how the media-driven aspect of her emergence to sudden fame usually is obscured these days. The Florida station made no mention of the Washington Post‘s overheated and erroneous report that gave rise to the hero-warrior myth of Jessica Lynch. The myth is examined in detail in a chapter in my forthcoming book, Getting It Wrong, which is due out in the summer. In it, I recount how Lynch was catapaulted to sudden and unsought fame during the first days of the war in Iraq. Lynch then was a 19-year-old supply clerk in the Army’s 507th Maintenance Company. 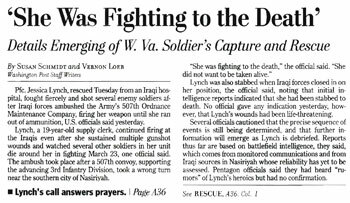 On March 23, 2003, elements of the 507th were ambushed by Iraqi irregulars in the southern city of Nasiriyah. Lynch was badly injured in the crash of her Humvee and was taken prisoner. Nine days later, she was rescued by a U.S. special operations unit from a hospital in Nasiriyah. It was a terrific story that was immediately picked up by news outlets across the United States and around the world. The battlefield heroics attributed to Lynch were, quite likely, the deeds of another soldier in her unit, a cook from Oregon named Donald Walters. He fought the Iraqis till his ammunition ran out, was captured, and was executed. Central to the myth enveloping the Lynch case is that the U.S. military encouraged and promoted the phony hero-warrior story, to help boost public support for the war. The Post’s hero-warrior story about Lynch has had many unintended consequences beyond vaulting Lynch to celebrity status, which, as her appearance in Florida suggests, has never fully receded. Her celebrity status also helped pave the way for her lucrative book contract with Bragg. And certainly it obscured the actions of Walters, whose conduct Nasiriyah probably saved the lives of some of his fellow soldiers.